Mike Moore | The Journal Gazette Mad Ants guard Tra-Deon Hollins looks to pass the ball against Rio Grande Valley at Memorial Coliseum. Talk about unexpected news. 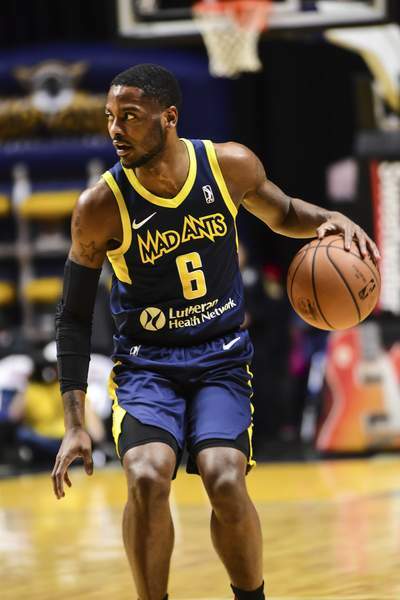 The Mad Ants have released point guard Tra-Deon Hollins. And I don't have an answer why. General manager Brian Levy declined to comment on the situation today. What I can tell you is this doesn't seem like the typical February surprise move, where a player maybe has an opportunity to make more money overseas or is trying to just get released so he can safeguard his body for something during the summer, but I really don't know at this point. I don't want to speculate; there are so many things this could be. The Mad Ants don't even retain the rights to Hollins, who was second in the G League in assists (8.4) and steals (2.6), and was averaging 7.2 points over 30 games. Well, I guess they did.